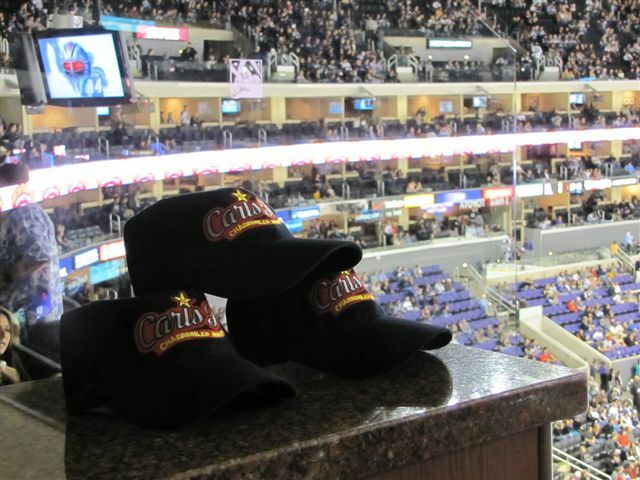 What is better than watching a L.A. Kings hockey game in a fancy suite at the Staples Center? Watching the game in a Slanket of course! In honor of the new Carl's Jr. Grilled Cheese Bacon Burger, the fast food restaurant invited me and a few others to enjoy a “suite” view of the game. 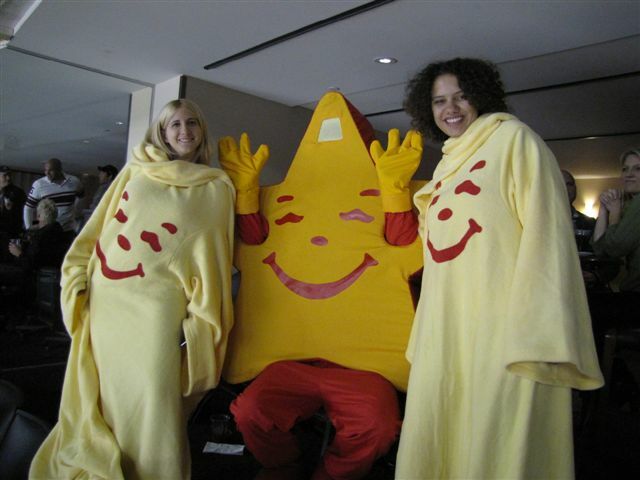 We were also given a Happy Star designed Slanket to wear. Like a Snuggie, the Slanket is a gigantic fleece blanket with sleeves. 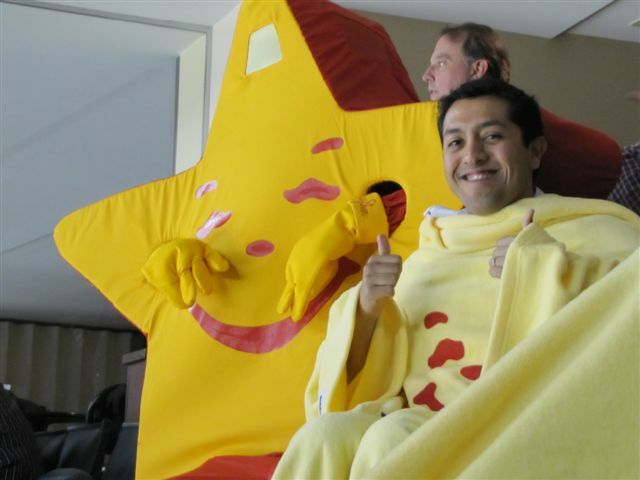 Eagerly, I was the first to don the yellow blanket with Happy Star's smiling face on it, but as the chill from the ice came through, more and more did, even Raphael and my blogger friend Katelin. People from the other rooms and seats kept looking over at our cozy group, especially when the Happy Star himself joined us along with the Kings' mascot Bailey. 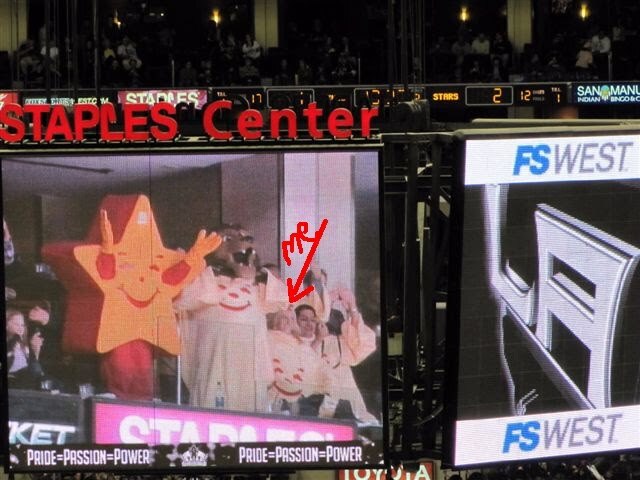 This is when the jumbo tron also chose to highlight our group in their fan cam. You can barely see me in the shot we took of the screen, but I'm all the way to the right. My blond hair kind of matches in with the yellow slanket. 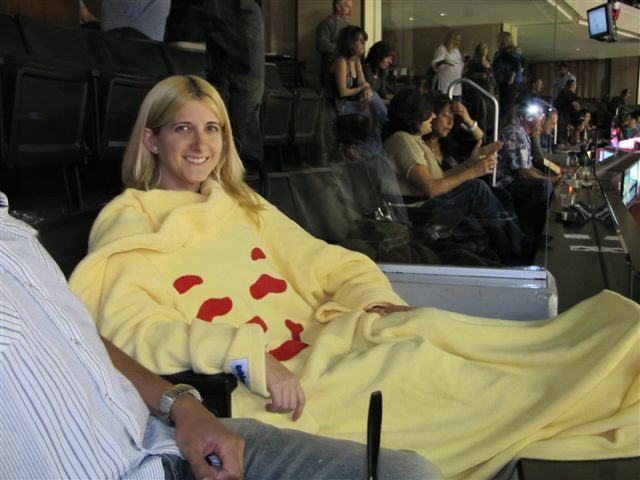 Now, do I have the confidence to wear this Slanket to a general game in my usual nosebleed seats? hmmm, maybe to the next evening Chivas soccer game, long flight or beach bonfire. The Kings meanwhile got spanked, losing 4-1 to the Dallas Stars. Oh, and on our way home we actually hit up a Carl's Jr. drive-thru and had their Chocolate Chip Banana shake, which was actually really amazing and had little bits of chocolate chips in it, yum! love our snuggie picture, haha. such a fun night! lol - you made the jumbo tron - that kind of rocks!!! 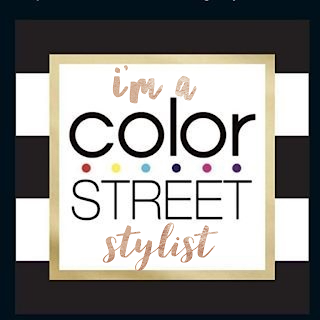 Lol you rock it girl! this is hilarious. I love how you all wore the snuggies.